Kids love swimming at Purity Spring Resort. Remember the carefree, simple joys of summer camp? The smell of a campfire, ghost stories under the stars, races to the raft, archery lessons, and friendship bracelets. Flushed from the sun and weary from the day’s activities, you’d slip into your cabin bunkbed and fall fast asleep. And wake up early the next morning, bright and eager to do it all again. Those were the days, and you can live them again with your own kids. Ross was talking about their family vacations at the AMC Echo Lake Camp in Mount Desert, Maine. Ross, his wife, and two sons, now ages 12 and 14, have been going to “camp” for a week each summer since 2011. It’s a simple getaway: three square meals, lots of outdoor activities, the comradery of other families, and a break from their noisy, high-tech, quotidian lives. No wonder family camp-style vacations are becoming wildly popular, fueled by a desire to escape the hustle and bustle of everyday life to spend quality time together. Think laid-back, active vacations with modest accommodations, communal dining, a ton of activities, and the great outdoors. Some camps are more luxe, with child care programs, adult activities, and restaurants and bars; others are more basic. But the top amenity is the same: time together to unplug and reconnect. Here are a few of our favorites. Longing for some good, old-fashioned nostalgic fun? You won’t find a more timeless, relaxed summer vacation, than a stay at this easy-going, family resort in Madison, N.H., located on a 75-acre, private, spring-fed lake, abutting the Hoyt Wildlife Sanctuary. 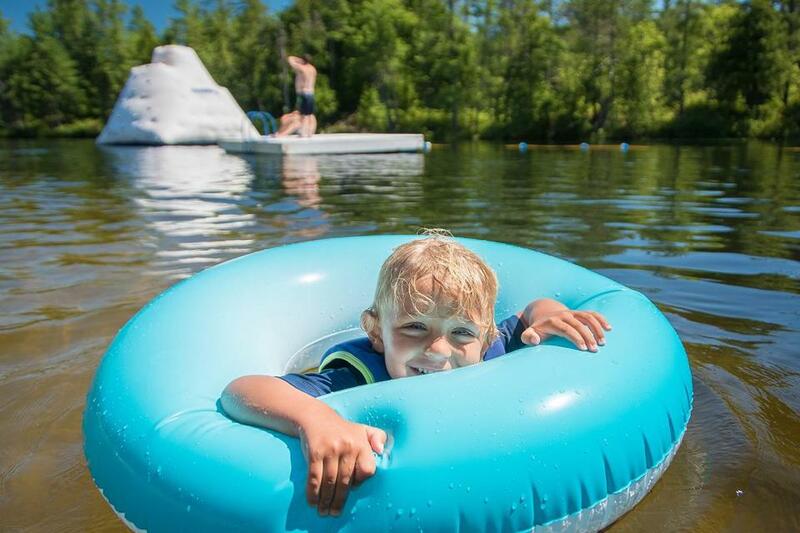 Owned by the Hoyt family for five generations, the resort offers the quintessential family camp experience. “Compact.” “Safe.” “Kids can run around and parents can relax.” These are some of the most frequent comments from resort guests. It’s also a place that families come again and again. “We have families return every summer. Some have been coming for over 50 years introducing multiple generations of their family to summer at Purity Spring Resort,” says Thomas Prindle, Director of Marketing at Purity Spring. Kids make new friends during a stay at the Purity Spring Resort. There are several lodging choices in buildings spread throughout the property, including traditional hotel-style rooms and suites (with private baths), two-bedroom lakeside cottages with kitchenettes, and larger condo units with full kitchens and separate living areas, sleeping up to 10 guests. Don’t expect anything fancy, but the accommodations are clean and adequate for a family stay. If vacation to you means no cooking, Traditions Restaurant & Pub offers breakfast, lunch and dinner, with a straightforward menu of pancakes and eggs, salads and sandwiches, and updated comfort food classics such as grilled salmon, New York strip steak, and pork loin Milanese. The focus is on outdoor fun. There are five, small private beaches, miles of nearby hiking and mountain biking trails, and lots of activities, including fishing, sailing, archery, arts and crafts, lawn games, and more. Kids spend their days swimming and playing at the beach (there’s also an indoor pool), kayaking or canoeing on the lake, or playing games with other kids. Water skiing, wakeboarding, and knee boarding are also popular, along with evening campfires, outdoor breakfast cookouts and the longstanding Thursday night lobster bake on the beach. 1251 Eaton Road, Madison, N.H., 800-373-3754, www.purityspring.com. The all-inclusive summer vacation package for a family of four (two adults, two children) begins at $486.50 per night. If you’re a family that loves to keep busy, morning to night, consider this sprawling, bustling 775-acre resort on the southwestern shores of Sebago Lake in Casco, Maine. The Disney-like property, complete with character mascots (meet Squeaky the Squirrel, Mortimer the Moose, Stinky the Skunk, and others), has nonstop action for all ages, with an 18-hole golf course and driving range, a marina (power boat rentals available), a one-mile-long sandy beach, restaurant, Tiki Bar and lounges, a minigolf course, video arcade and teen center. There are modest homes and cottages to rent, as well as RVs and tent sites. The accommodations are pretty basic, but you won’t be spending much time inside. This is the place to check out the daily list of activities that runs the gamut: arts and crafts, painting classes, contests, pirate cruises, live entertainment, theater, carnivals, karaoke, game nights, and more. Supervised children’s camps (half- and full-day) are also offered, led by a crew of more than 40 friendly, young counselors, so Mom and Dad can lounge at the beach (or compete in the pickleball tournament!) Tip: reserve a golf cart when you book (they sell out quickly) or bring your bikes to get around. 261 Point Sebago Lake, Casco, Maine, 800-655-1232, www.pointsebago.com. Weekly rates are campsites $455-$735, park homes $1,610-$2,345, cottages $1,645-$2,345. Food is additional. 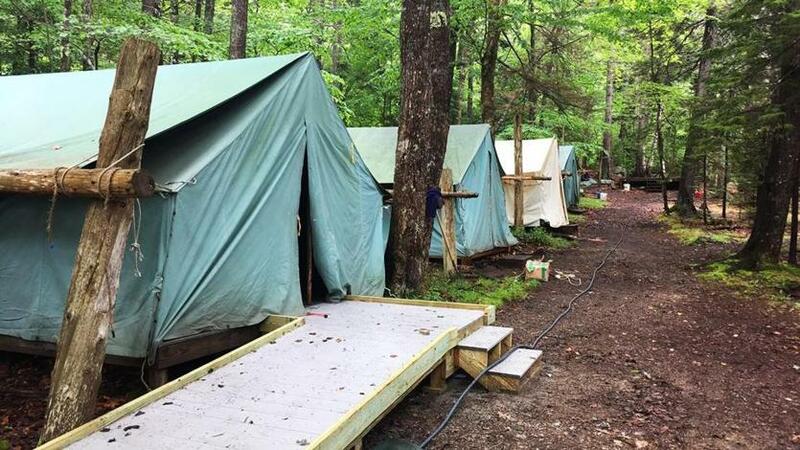 At AMC Echo Lake Camp in Mount Desert, Maine, families stay in canvas-sided platform tents with cots and mattresses. Want to explore the beauty of Acadia National Park, without the hefty price tag? Sign up for the AMC Echo Lake Camp adventure, offered weekly throughout the summer. The longstanding camp on Maine’s Mount Desert Island has been luring families since 1925, with its beautiful lakefront setting, naturalist programs, and value-packed prices. You’ll stay in canvas-sided platform tents with cots and mattresses. There’s a bathhouse with hot showers and flush toilets, a dining hall and a recreation room (a great option on rainy days). There are also boats to use — kayaks, canoes, and small sailboats. The days flow easily. After an early breakfast, you can join a guided hike (three difficulty levels are offered each day) in and around Acadia National Park, returning to camp for lunch. Afternoons are typically free for you to explore the park and surrounding areas on your own, or to relax at camp. Evening programs may include naturalist talks, slide shows, games, and talent shows. During the week, you’ll have an opportunity to take a boat to Baker Island in Frenchman Bay, enjoy a lobster cookout, and a mussel picnic at camp. Mount Desert, Maine, 207-244-3747, www.amcecholakecamp.org. All-inclusive weekly rates are adults $690 (AMC member) $762 (nonmember), ages 11-15 $588/$650, ages 4-10 $450/$506. Not recommended for children under the age of 4. Weeklong family camps are also offered in New Hampshire at AMC Cold River Camp in White Mountain National Forest and AMC Three Mile Island Camp on Lake Winnipesaukee. “Best experience we’ve had traveling as a family.” “Restful and relaxing for everyone.” “Should have come sooner.” Guests gush about this all-inclusive, splurge-worthy resort set on 165 acres along Lake Champlain in northern Vermont, consistently giving it a TripAdvisor five-star rating. More luxurious than rustic, the four-generation, family-owned property has pools, hot tubs, tennis courts, full fitness center, children’s playhouse and clubhouse, a cocktail lounge, and a slew of activities. Cottages and suites include separate bedrooms and living areas, most with private screened-in porches and kitchenettes. Three buffet-style meals are included, featuring locally-sourced, healthy choices. The resort is well-known for its top-notch counselors and kids programming. There are 10 age-specific camps for the kids, offered in the morning, so parents are free to relax or participate in other activities, including off-property tours, hiking, biking, sailing, and more. Family time is built into the afternoon. The resort also offers a children’s program in the evenings, so adults can attend social events, like trivia nights, jazz nights, and dances. 175 Tyler Place, Highgate Springs, Vt., 802-868-4000, www.tylerplace.com. Peak season all-inclusive rates start at $270 per day, per adult, $150 per day, per child. Guests enjoy family-style dining at the Ohana Family Camp, set on 112 acres along Lake Fairlee in Vermont. No Internet. No television. No high-tech toys. And that’s the beauty of a stay at the Ohana Family Camp in central Vermont. “The escape from technology is one of the things our families cherish most about their time at Ohana. It’s an opportunity to unplug and focus on what matters most: each other,” says Jenn Merritt, director of communications, Aloha Foundation. Ohana, set on 112 acres along Lake Fairlee with sweeping mountain and valley views, is one of five summer camps operated by the nonprofit Aloha Foundation. Families stay in rustic cabins or platform tents and enjoy family-style dining focusing on fresh, local ingredients — some from the camp’s two gardens. Simple pleasures abound. Arts and crafts classes are wildly popular, including ceramics, stained glass, basket making, tie dying, jewelry making, and painting, along with woodworking and leather work. There are nature hikes, boating, swimming, a high ropes course, climbing tower, and lawn games. Or, take a yoga or tai chi class, or learn to belly dance. In the evenings, there’s storytelling, campfires, and dances. Or sit back and gaze at the inky, star-studded skies, far from city lights. 341 Quinibeck Road, Post Mills, Vt., 802-333-3460, www.alohafoundation.org. All-inclusive weekly rates are $1,470 tent (1-2 people), $2,245 one-bedroom cabin (2 people), $4,870 two-bedroom cabin (5 people) and $7,100 four-bedroom cabin (7 people).